Just because your site needs to be down for a while doesn’t mean it needs to be ugly. WordPress is a great blogging platform that allows you to make amazing websites for all sort of things, not just a blog 6 Ways to Use WordPress That Aren't Blogging 6 Ways to Use WordPress That Aren't Blogging Read More . Website owners spend a lot of time working on their beloved piece of cyberspace, but the default WordPress maintenance page, which simply has text saying “Maintenance mode, come back later”, leaves a lot to be desired. So here’s how you can make the perfect maintenance page that fits in with your website’s theme. The maintenance page consists of a simple HTML file that will be displayed when you put WordPress into maintenance mode. Being the great guy that I am, I’ve made a template for you to download and edit to your liking. The package consists of two files: the html maintenance file, and the MakeUseOf logo. You can download the files in a .zip archive by clicking here. As you can see the page is very basic, but it is themed perfectly for us here at MUO. The font, colours and logo all match our brand. You need to edit the html file, of course, so that it matches the theme on your WordPress site. Simply right click on the html file and select Open With, and then open the file with a text editor. If you’re using Windows, I would recommend Notepad++ , a compact word processor with more features 3 Handy Built-In Notepad++ Features For Beginners [Windows] 3 Handy Built-In Notepad++ Features For Beginners [Windows] This summer, I’ve used Notepad++ for my internship quite a bit, so I can see why almost all developers and programmers I know actually prefer it, not to mention, the thousand of Notepad++ fans that... Read More than the standard Windows notepad. Once you opened the html file, you will see I have added many invisible notes to assist you when editing. They are shown in blue in the screenshot below. You can use these notes to help you edit the maintenance page to your liking. Now that you have your pretty awesome looking WordPress maintenance page it’s time to make it work with your site. You first need to install a plugin called WP Maintenance Mode. This is done in the same way as all other plugins: simply go to the plugins page within WordPress and select Add New. Then search for “wp maintenance mode”. There is more than one maintenance mode plugin, so make sure you install the one that’s been created by Frank Bültge. Once installed, activate the plugin and click on the settings button underneath where is says WP Maintenance Mode in your list of plugins. The third and final step in this process is to upload your maintenance page to your web host, so that you can use it. But first we need to rename the wp-maintenance-mode.html file to wp-maintenance-mode.php. Once you’ve done that, connect to your web host via FTP (if you’re not sure how, then take a look at these really great tips for using Filezilla Master FTP File Transfers On All Of Your Sites With FileZilla Master FTP File Transfers On All Of Your Sites With FileZilla A large number of FTP clients of old had hiccups when it came to large file transfers. The apps experienced the usual timeouts that you would expect when the computer sits there for 15 to... Read More ) and navigate to the wp-content folder inside your websites root folder. Once there, upload your wp-maintenance-mode.php file along with any other files that are associated with it, like your websites logo, or possibly even a background image for your page like I have. That’s it! You’re all set to use your new, themed maintenance page. Everything is now set up, you just need to make sure it’s all working. Head back to WordPress, where you should still be on your plugins page with the settings for WP Maintenance Mode expanded. All you need to do now is turn maintenance mode on by changing the Plugin Active drop-down menu from False, to True. Then click Update. If you now log out and navigate to your homepage, you should see your shiny new maintenance mode page displayed. Pretty cool huh? While WP Maintenance Mode is enabled, you can still log in to the WordPress admin back-end by going to http://yoursite.com/wp-admin, where you can make all the changes you need to make whilst your site is in maintenance mode. Once you’re logged in, if you navigate to your websites home page you will see the normal live page that would be displayed when the site isn’t in maintenance mode. This is so that you can preview any changes you have made, while visitors will continue to see your maintenance page. Once you’re finished, simply change the Plugin Active drop-down menu from True to False, and click Update. All visitors will then see your normal homepage again. 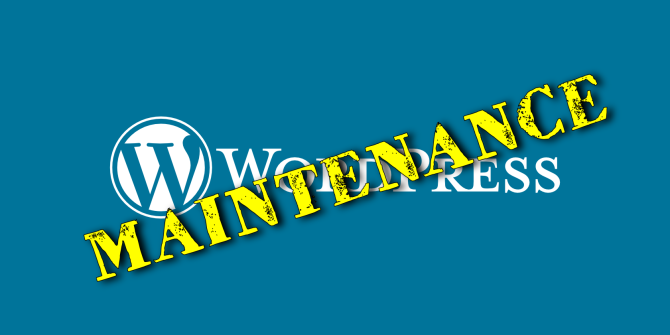 Having a themed maintenance page for WordPress will set you aside from the crowd. Using the default WordPress maintenance page could make your site look unprofessional, and possibly even put your visitors off visiting again. Why take the chance when adding an awesome maintenance page is so easy? If you have followed this process and made your own WordPress maintenance page, then please: feel free to link to them in the comments section. We would love to see what you guys come up with, and I’m sure other readers would too. Tried as you did, but i just get an X where the image should be.